American orbital launch vehicle. Titan 3A with five segment solid motors. Man-rated design originally developed for Dynasoar spaceplane. AKA: SLV-4;SLV-5;SLV-5C;Titan 3C. Status: Retired 1982. First Launch: 1965-06-18. Last Launch: 1982-03-06. Number: 36 . Payload: 13,100 kg (28,800 lb). Thrust: 10,586.80 kN (2,380,007 lbf). Gross mass: 626,190 kg (1,380,510 lb). Height: 42.00 m (137.00 ft). Diameter: 3.05 m (10.00 ft). Apogee: 185 km (114 mi). LEO Payload: 13,100 kg (28,800 lb) to a 185 km orbit. Payload: 3,000 kg (6,600 lb) to a GTO. Launch Price $: 18.000 million in 1965 dollars. Flyaway Unit Cost 1985$: 66.700 million in 1985 dollars. Stage 3. 1 x Titan Transtage. Gross Mass: 12,247 kg (27,000 lb). Empty Mass: 1,950 kg (4,290 lb). Thrust (vac): 71.166 kN (15,999 lbf). Isp: 311 sec. Burn time: 440 sec. Diameter: 3.05 m (10.00 ft). Span: 3.05 m (10.00 ft). Length: 4.57 m (14.99 ft). Propellants: N2O4/Aerozine-50. No Engines: 2. Engine: AJ10-138. Other designations: Transtage. Status: Out of Production. Family: orbital launch vehicle. Country: USA. Engines: AJ10-138, LR91-9, LR87-9, LR87-11, LR91-11. Spacecraft: Gemini, Oscar, ERS, Dynasoar, OV1, LES, LCS, OV2, GGTS, IDCSP, MOL, OV4, Advanced Vela, OV5, DODGE, Solrad, TACSAT, DSP, DSCS II, ATS-6, Chalet. Projects: ATS, DSCS. Launch Sites: Cape Canaveral, Vandenberg, Cape Canaveral LC40, Cape Canaveral LC41. Stages: Titan 3A-1, Titan 3A-2, Titan Transtage, UA1205. Agency: Martin Marietta. 1959 September 16-18 - . LV Family: Titan. Launch Vehicle: Titan IIIC. Plans for advanced launch vehicles - . Nation: USA. Related Persons: Glennan. Program: Apollo. The ARPA-NASA Booster Evaluation Committee appointed by Herbert F. York, DOD Director of Defense Research and Engineering, April 15, 1959, convened to review plans for advanced launch vehicles. A comparison of the Saturn (C-1) and the Titan-C boosters showed that the Saturn, with its substantially greater payload capacity, would be ready at least one year sooner than the Titan-C. In addition, the cost estimates on the Titan-C proved to be unrealistic. On the basis of the Advanced Research Projects Agency presentation, York agreed to continue the Saturn program but, following the meeting, began negotiations with NASA Administrator T. Keith Glennan to transfer the Army Ballistic Missile Agency (and, therefore, Saturn ) to NASA. 1961 January 26 - . LV Family: Titan. Launch Vehicle: Titan IIIC. Large solid-propellant motor segment tested. - . Aerojet-General Corporation successfully test fired a 20-ton, 65-inch diameter, solid-propellant motor segment that produced 400,000 pounds of thrust for 18 seconds..
1961 May 13 - . LV Family: Titan. Launch Vehicle: Titan IIIC. Plan for development of Titan III. - . SSD presented a preliminary plan for development of a high-lift booster that would wrap large solid-propellant booster engines around a liquid-rocket second stage center core vehicle..
1961 June 3 - . LV Family: Titan. Launch Vehicle: Titan IIIC. Solid-propellant rocket motor of 500,000 pounds of thrust test fired. - . Aerojet-General test fired a large solid-propellant rocket motor generating 500,000 pounds of thrust at its Sacramento, California, test facility..
1961 June 5 - . LV Family: Titan. Launch Vehicle: Titan IIIC. Solid booster program meeting requirements of both NASA and the Air Force. - . Undersecretary of the Air Force Joseph V. Charyk instructed Headquarters USAF to prepare a solid booster program that would satisfy the requirements of NASA and the Air Force..
1961 October 5 - . LV Family: Titan. Launch Vehicle: Titan IIIC. Titan III to be a standard military space launch vehicle. - . Space Systems Division provided Headquarters AFSC with a special study of the Titan II with strap-on solid boosters as the concept for a standard military space launch vehicle - named Titan III..
1961 October 13 - . LV Family: Titan. Launch Vehicle: Titan IIIC. Early program definition actions for the Titan III. - . Dr. Harold Brown, Director of Defense Research and Engineering (DDR&E), authorized the Air Force to begin early program definition actions for the development of the Titan III..
1961 November 27 - . LV Family: Titan. Launch Vehicle: Titan IIIC. Bleymaier Director of Titan III Program - . Colonel Joseph S. Bleymaier was appointed Director of Titan III Program (Program 624) at Headquarters SSD..
1961 December 15 - . LV Family: Titan. Launch Vehicle: Titan IIIC. Titan III program office. - . 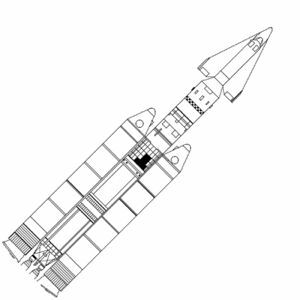 SSD established a Deputy for Titan III (Program 624A) program office to develop a space standard launch vehicle (SLV) and system built around a Titan II with two strap-on, 120-inch diameter motors..
1961 December 18 - . LV Family: Titan. Launch Vehicle: Titan IIIC. New method to steer large-size solid-propellant rockets. - . United Technology Center (UTC) announced the successful test of a new experimental method to steer large-size solid-propellant rockets. Called liquid thrust vector control (TVC), this technique used a gas or liquid that was sprayed into the exhaust path of rocket engine exhaust, thus deflecting the exhaust and thereby turning the vehicle. The test was conducted on a 450,000-pound thrust solid-fuel engine. 1961 December 21 - . LV Family: Titan. Launch Vehicle: Titan IIIC. Production contract for the solid-propellant rocket motor for the Titan III. - . SSD awarded a contract to United Technology Center for production of the 120-inch diameter, solid-propellant rocket motor for the Titan III..
1962 February 16 - . LV Family: Titan. Launch Vehicle: Titan IIIC. 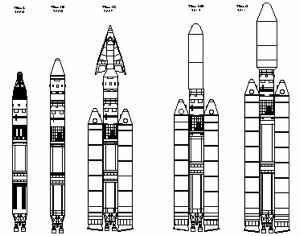 Design criteria for the Titan III. - . Space Systems Division awarded a contract to the Martin Marietta Corporation to study the design criteria for the Titan III standardized space launch vehicle..
1962 April 7 - . LV Family: Titan. Launch Vehicle: Titan IIIC. Titan IIIC solid-propellant booster contractor - . A Titan III source selection board recommended United Technology Center as the developer of the solid-propellant booster motors..
1962 April 14 - . LV Family: Titan. Launch Vehicle: Titan IIIC. United Technology Center selected for the solid-propellant rocket motors for the Titan III. - . Space Systems Division selected the proposal submitted by United Technology Center for the 120-inch diameter, solid-propellant rocket motors for the Titan III..
1962 June 9 - . LV Family: Titan. Launch Vehicle: Titan IIIC. Combined Titan I liquid-fueled engine - solid-propellant rocket motor test fired to validate Titan III. - . A Titan I liquid-fueled engine was strapped to the side of a 175-ton solid-propellant rocket motor, and the configuration was test fired by Aerojet-General Corporation. This evaluated the compatibility of liquid and solid engines for SSD's Titan III space launch vehicle. The combination generated 700,000 pounds of thrust. 1962 August 20 - . LV Family: Titan. Launch Vehicle: Titan IIIC. US Department of Defense announced Titan III launch vehicle. - . Nation: USA. Related Persons: McNamara. The Department of Defense announced plans to develop a Titan III launch vehicle powered by both solid and liquid fuel rocket motors with a total thrust of over 11 million newtons (2.5 million Ibs). .Scheduled to become operational in 1965, the Titan III would be used to launch the Air Force's X-20 (Dyna Soar) manned spacecraft, as well as heavy unmanned military satellites. Martin Marietta Corporation had been selected as prime contractor for the project, at an estimated cost of between $500 million and $1 billion. At a news conference the following day, Defense Secretary Robert S. McNamara cited the Titan III as a major step toward overtaking the Soviet Union in various phases of military space development. Titan III to be operational by 1965. - . The Defense Department announced plans to develop the Titan III launch vehicle that was to be operational by 1965. Martin Marietta Corporation would be the systems integration (prime) contractor for the Titan III program that was managed by AFSC's Space Systems Division. 1962 November 1 - . LV Family: Titan. Launch Vehicle: Titan IIIC. Contract for Phase II development of the solid-propellant rocket motors for Titan III. - . Space Systems Division awarded a $173 million contract to United Technology Center for Phase II development of the five-segment, 120-inch diameter, solid-propellant rocket motors for Titan III..
1962 December 1 - . LV Family: Titan. Launch Vehicle: Titan IIIC. Development phase of the Titan III program begins. - . The Martin Marietta Corporation was awarded a contract for Titan III airframe, systems, integration, and testing..
1962 December 21 - . LV Family: Titan. Launch Vehicle: Titan IIIC. Contract for solid rocket motors for the Titan 3. - . USAF awarded a $30 million contract to United Technology Center (UTC) for the design, development, delivery, and flight of large, segmented, solid rocket motors for the Titan 3..
1963 February 23 - . LV Family: Titan. Launch Vehicle: Titan IIIC. First static firing of one segment version of the Titan III solid rocket motor. - . United Technology Center (UTC), the contractor for the Titan III solid-rocket motors, successfully conducted the first static firing of one segment of the large-size, 120-inch diameter motor. This would be used as the first stage (Stage 0) booster. 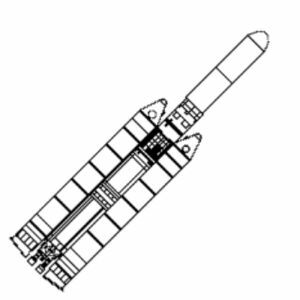 UTC was developing a single engine of five segments as the basic booster. 1963 February 25 - . LV Family: Titan. Launch Vehicle: Titan IIIC. Contract for Titan III standard launch vehicles for space missions. - . The Air Force announced the formal contract award to Martin Marietta Corporation for the design, development, fabrication, and delivery of Titan III standard launch vehicles for space missions. Martin Marietta would act as the systems integration contractor, while Aerojet-General would produce the liquid-fuel propulsions systems for the Titan core section and United Technology Center (UTC) would provide the solid-rocket motors (SRMs) for the booster. 1963 July 15 - . LV Family: Titan. Launch Vehicle: Titan IIIC. Approval for the continued development of the Titan III. - . Related Persons: , McNamara. After a detailed, six-month review of the Titan III program, Secretary of Defense Robert S. McNamara approved the continued development of the Titan III..
1963 July 20 - . LV Family: Titan. Launch Vehicle: Titan IIIC. World's largest solid-rocket motor test fired. - . The first full-scale, five-segment solid-propellant booster motor for the Titan III, the world's largest solid-rocket motor (SRM), was test fired at the United Technology Center's test facility. The motor produced over 1,000,000 pounds of thrust during its 110-second firing. 1963 July 23 - . LV Family: Titan. Launch Vehicle: Titan IIIC. First test firing of Transtage propulsion system - . At its Sacramento test facility, the Aerojet-General Corporation conducted the first test firing of the twin-engine propulsion system that would power the Titan III upper stage..
1963 November 13 - . LV Family: Titan. Launch Vehicle: Titan IIIC. First Titan III engine - . Space Systems Division accepted the first Titan III engine from Aerojet-General at its Sacramento facilities. The first and second stage liquid engines, 430,000 and 100,000 pounds of thrust respectively, were for the Titan IIIA vehicle that would test the basic center core configuration (Stages 1 and 2) of the eventual Titan IIIC vehicle. 1964 June 26 - . LV Family: Titan. Launch Vehicle: Titan IIIC. First of 17 flight test versions of the Titan III standard space launch vehicles accepted. - . Space Systems Division accepted the first of the programmed 17 flight test versions of the Air Force Titan III standard space launch vehicles from the Martin Marietta Corporation. This vehicle was the first of five Titan IIIA (SLV-5A) missiles that would test the center core section before the two strap-on solid-rocket motors were added to form the first Titan IIIC booster vehicle. 1964 July 1 - . LV Family: Titan. Launch Vehicle: Titan IIIC. IDCSP satellites as secondary payloads on Titan IIIC research and development launches. - . Spacecraft: IDCSP. Discussions between the Titan III System Program Office (SPO) and the Initial Defense Communications Satellite Program (IDCSP) SPO were initiated to investigate the possibility of using IDCSP satellites as secondary payloads on Titan IIIC research and development launches. 1964 July 7 - . LV Family: Titan. Launch Vehicle: Titan IIIC. Titan III contract lauded as one of the best managed. - . Related Persons: , McNamara. Secretary of Defense Robert S. McNamara reported to President Lyndon B. Johnson that Space Systems Division's Titan III contract with Martin Marietta was one of the best managed contracts in the DoD. This was said to be due to the incentives applied to the program. At present, McNamara reported that the Titan III program was one percent below cost estimates and savings were being accomplished without harm to defense posture. 1964 July 11 - . LV Family: Titan. Launch Vehicle: Titan IIIC. Titan III Transtage engine was static fired - . The Titan III Transtage engine was successfully static fired for over six minutes. This test firing verified its various subsystems..
1964 October 20 - . LV Family: Titan. Launch Vehicle: Titan IIIC. Phase II of IDCSP - . Spacecraft: IDCSP. Headquarters USAF and AFSC directed the go-ahead for Phase II of the Initial Defense Communications Satellite Program (IDCSP) with a funding ceiling of $30 million after 14 September 1964. This action approved the launch of three IDCSP payloads on Titan IIIC research and development vehicles that were to be launched in the first half of 1966. 1964 November 13 - . LV Family: Titan. Launch Vehicle: Titan IIIC. Titan III solid-propellant rocket motor static test fired. - . A 250-ton, 120-inch diameter, solid-propellant rocket motor was static test fired for 110 seconds as part of the Air Force's Titan III standard launch vehicle research and development program. Two of the 120-inch motors were to be attached to a Titan II liquid-propellant core vehicle to form the Titan IIIC space booster (SLV-5C). This test firing was important because it was the first test of the booster's flight instrumentation and the newly designed ablative nozzle-throat that replaced the former carbon throat. 1965 October 15 - . Launch Site: Cape Canaveral. Launch Complex: Cape Canaveral LC40. LV Family: Titan. Launch Vehicle: Titan IIIC. FAILURE: Partial Failure..
OV2-01 - . Mass: 170 kg (370 lb). Nation: USA. Agency: USAF. Class: Earth. Type: Magnetosphere satellite. Spacecraft: OV2. Decay Date: 1972-07-27 . USAF Sat Cat: 1624 . COSPAR: 1965-082B. Apogee: 791 km (491 mi). Perigee: 708 km (439 mi). Inclination: 32.60 deg. Period: 99.80 min. Dual launch with LCS 2; upper stage broke up. Space craft engaged in investigation of spaceflight techniques and technology (US Cat A). .
Transtage 4 - . Mass: 189 kg (416 lb). Nation: USA. Agency: USAF. Spacecraft: OV2. Decay Date: 1972-07-27 . USAF Sat Cat: 1624 . COSPAR: 1965-082xx. Apogee: 264 km (164 mi). Perigee: 229 km (142 mi). Inclination: 32.30 deg. Period: 89.40 min. LCS 2 - . Payload: OV2-01 / Transtage 4. Nation: USA. Agency: USAF. Class: Surveillance. Type: Radar calibration target. Spacecraft: LCS. Decay Date: 1965-10-15 . USAF Sat Cat: 1624 . COSPAR: 1965-082A. Apogee: 785 km (487 mi). Perigee: 730 km (450 mi). Inclination: 32.30 deg. Period: 99.98 min. The second Titan IIIC (Vehicle #4) was successfully launched from Cape Canaveral. This was the first Titan IIIC to carry an operational payload. Three satellites were placed in orbit - an LCS-2 radar calibration sphere, an OV 2-1 radiation sensor, and a metal-ballasted dummy payload. All systems performed well until the second planned burn of the Transtage engines just prior to the injection of the multiple payload into orbit. At this point in the mission, the Transtage exploded due to a malfunction, abruptly terminating the mission. Dual launch with OV2-1; upper stage broke up. LCS 2 - . Mass: 189 kg (416 lb). Nation: USA. Agency: USAF. Spacecraft: OV2. COSPAR: 1965-082xx. The second Titan IIIC (Vehicle #4) was successfully launched from Cape Canaveral. This was the first Titan IIIC to carry an operational payload. Three satellites were placed in orbit - an LCS-2 radar calibration sphere, an OV 2-1 radiation sensor, and a metal-ballasted dummy payload. All systems performed well until the second planned burn of the Transtage engines just prior to the injection of the multiple payload into orbit. At this point in the mission, the Transtage exploded due to a malfunction, abruptly terminating the mission. 1965 December 21 - . Launch Site: Cape Canaveral. Launch Complex: Cape Canaveral LC41. LV Family: Titan. Launch Vehicle: Titan IIIC. Transtage 8 - . Mass: 189 kg (416 lb). Nation: USA. Agency: USAF AFSC. Spacecraft: OV2. Decay Date: 1975-08-17 . USAF Sat Cat: 1863 . COSPAR: 1965-108A. Apogee: 22,114 km (13,740 mi). Perigee: 337 km (209 mi). Inclination: 26.90 deg. Period: 387.40 min. For the first time, Launch Complex 41, at the just completed Integrate-Launch-Transfer (ITL) complex at Cape Canaveral was used to launch the third Titan IIIC research and development space booster (Vehicle #8). As with the second vehicle, this Titan IIIC performed flawlessly throughout the liftoff and boost segments of the flight plan. However, severe difficulties were encountered when the Transtage engines malfunctioned and did not restart for the programmed third burn. Thus, the vehicle failed to reach near-synchronous equatorial orbit with its four-satellite payload. Lincoln Experimental Satellites LES-3 and LES-4 were released as was Oscar IV, but the OV2-3 payload remained attached to the Transtage. OV2-03 - . Mass: 193 kg (425 lb). Nation: USA. Agency: USAF. Class: Earth. Type: Magnetosphere satellite. Spacecraft: OV2. Decay Date: 1975-08-17 . COSPAR: 1965-108xx. Apogee: 22,846 km (14,195 mi). Perigee: 321 km (199 mi). Inclination: 26.80 deg. Period: 399.30 min. Upper stage separation failed. Space craft engaged in investigation of spaceflight techniques and technology (US Cat A). .
Oscar 4 - . Mass: 13 kg (28 lb). Nation: USA. Agency: OSCAR. Program: Oscar. Class: Communications. Type: Amateur radio communications satellite. Spacecraft: Oscar. Decay Date: 1976-04-12 . USAF Sat Cat: 1902 . COSPAR: 1965-108C. Apogee: 33,549 km (20,846 mi). Perigee: 162 km (100 mi). Inclination: 26.80 deg. Period: 587.50 min. OSCAR IV was launched piggyback with three United States Air Force satellites. The launch vehicle had a partial failure and placed the spacecraft in a low orbit preventing widespread amateur use. Orbit 29120 x 168 km. Inclination 26.8 degrees. Period 587.5 minutes. Weight 18.1 kg. Four monopole antennas. OSCAR IV was built by the TRW Radio Club of Redondo Beach, California. It had a 3 Watt 10 kHz wide linear transponder (144 MHz uplink and 432 MHz downlink). In operation until March 16, 1966. Re-entry April 12, 1976. Total operation 85 days. OSCAR IV provided the first US-Soviet amateur link. 1966 June 16 - . 14:00 GMT - . Launch Site: Cape Canaveral. Launch Complex: Cape Canaveral LC41. LV Family: Titan. Launch Vehicle: Titan IIIC. GGTS 1 - . Mass: 47 kg (103 lb). Nation: USA. Agency: USAF. Class: Technology. Type: Gravity gradient technology satellite. Spacecraft: GGTS. USAF Sat Cat: 2207 . COSPAR: 1966-053A. Apogee: 33,858 km (21,038 mi). Perigee: 33,663 km (20,917 mi). Inclination: 4.20 deg. Period: 1,334.00 min. Gravity gradient stabilization tests. Space craft engaged in investigation of spaceflight techniques and technology (US Cat A). .
IDCSP 1-5 - . Payload: IDCSP 5 / OPS 9315. Mass: 45 kg (99 lb). Nation: USA. Agency: USAF. Class: Communications. Type: Military communications satellite. Spacecraft: IDCSP. USAF Sat Cat: 2219 . COSPAR: 1966-053F. Apogee: 34,093 km (21,184 mi). Perigee: 33,712 km (20,947 mi). Inclination: 8.90 deg. Period: 1,340.90 min. Space craft engaged in investigation of spaceflight techniques and technology (US Cat A)..
IDCSP 1-4 - . Payload: IDCSP 4 / OPS 9314. Mass: 45 kg (99 lb). Nation: USA. Agency: USAF. Class: Communications. Type: Military communications satellite. Spacecraft: IDCSP. USAF Sat Cat: 2218 . COSPAR: 1966-053E. Apogee: 34,017 km (21,137 mi). Perigee: 33,694 km (20,936 mi). Inclination: 8.00 deg. Period: 1,338.60 min. Space craft engaged in investigation of spaceflight techniques and technology (US Cat A)..
IDCSP 1-2 - . Payload: IDCSP 2 / OPS 9312. Mass: 45 kg (99 lb). Nation: USA. Agency: USAF. Class: Communications. Type: Military communications satellite. Spacecraft: IDCSP. USAF Sat Cat: 2216 . COSPAR: 1966-053C. Apogee: 33,923 km (21,078 mi). Perigee: 33,657 km (20,913 mi). Inclination: 4.90 deg. Period: 1,335.30 min. Space craft engaged in investigation of spaceflight techniques and technology (US Cat A)..
IDCSP 1-7 - . Payload: IDCSP 7 / OPS 9317. Mass: 45 kg (99 lb). Nation: USA. Agency: USAF. Class: Communications. Type: Military communications satellite. Spacecraft: IDCSP. USAF Sat Cat: 2221 . COSPAR: 1966-053H. Apogee: 34,359 km (21,349 mi). Perigee: 33,711 km (20,947 mi). Inclination: 5.00 deg. Period: 1,347.60 min. A Titan IIIC (Vehicle #11) successfully supported a record-setting mission by placing eight satellites into near-synchronous orbits 18,200 miles above the equator. Seven communication satellites and one gravity gradient experimental satellite were included in this first launch in a series designed to establish a ring of experimental communications satellites dispersed around the equator. When completed, this satellite system would provide the Defense Department with a global military communication system designated the Initial Defense Satellite Communication System (IDSCS). Each of the seven satellites could relay 600 voice or 6,000 teletype channels. Space Systems Division was responsible for the development and launch of the spaceborne elements of the IDSCS as well as the Titan IIIC booster and launch services. Space craft engaged in investigation of spaceflight techniques and technology (US Cat A). IDCSP 1-3 - . Payload: IDCSP 3 / OPS 9313. Mass: 45 kg (99 lb). Nation: USA. Agency: USAF. Class: Communications. Type: Military communications satellite. Spacecraft: IDCSP. USAF Sat Cat: 2217 . COSPAR: 1966-053D. Apogee: 33,955 km (21,098 mi). Perigee: 33,669 km (20,920 mi). Inclination: 8.30 deg. Period: 1,336.40 min. Space craft engaged in investigation of spaceflight techniques and technology (US Cat A)..
IDCSP 1-6 - . Payload: IDCSP 6 / OPS 9316. Mass: 45 kg (99 lb). Nation: USA. Agency: USAF. Class: Communications. Type: Military communications satellite. Spacecraft: IDCSP. USAF Sat Cat: 2220 . COSPAR: 1966-053G. Apogee: 34,215 km (21,260 mi). Perigee: 33,707 km (20,944 mi). Inclination: 8.70 deg. Period: 1,343.90 min. Space craft engaged in investigation of spaceflight techniques and technology (US Cat A)..
IDCSP 1-1 - . Payload: IDCSP 1 / OPS 9311. Mass: 45 kg (99 lb). Nation: USA. Agency: USAF. Class: Communications. Type: Military communications satellite. Spacecraft: IDCSP. USAF Sat Cat: 2215 . COSPAR: 1966-053B. Apogee: 33,888 km (21,056 mi). Perigee: 33,656 km (20,912 mi). Inclination: 8.30 deg. Period: 1,334.40 min. 1966 August 26 - . 13:59 GMT - . Launch Site: Cape Canaveral. Launch Complex: Cape Canaveral LC41. LV Family: Titan. Launch Vehicle: Titan IIIC. FAILURE: Payload fairing broke up 78 seconds after launch.. Failed Stage: S.
IDCSP (8) ... IDCSP (14) - . Mass: 45 kg (99 lb). Nation: USA. Agency: USAF. Class: Communications. Type: Military communications satellite. Spacecraft: IDCSP. Decay Date: 1966-08-26 . 8 satellites, each weighing 45 kg..
IDCSP - . Payload: IDCSP. Mass: 45 kg (99 lb). Nation: USA. Agency: USAF. Spacecraft: IDCSP. OV4-03 - . Mass: 109 kg (240 lb). Nation: USA. Agency: USAF. Class: Technology. Type: Navigation technology satellite. Spacecraft: OV4. Decay Date: 1967-01-09 . USAF Sat Cat: 2524 . COSPAR: 1966-099A. Apogee: 305 km (189 mi). Perigee: 298 km (185 mi). Inclination: 32.80 deg. Period: 90.40 min. A Titan IIIC (Vehicle #9), the ninth research and development Titan III and sixth Titan IIIC to be launched from Cape Canaveral, completed the most difficult flight plan and most successful mission to date. The primary objective of injecting a modified Gemini spacecraft into a suborbital trajectory to test the reentry heat shield for the Manned Orbiting Laboratory (MOL) program was accomplished. After dipping down to 80 nautical miles to eject the MOL load, the Transtage pitched up and placed a canister containing 11 experiments into a 160-nautical mile circular orbit. Space craft engaged in investigation of spaceflight techniques and technology (US Cat A). Gemini B - . Payload: Gemini SC2. Mass: 1,800 kg (3,900 lb). Nation: USA. Agency: USAF. Class: Manned. Type: Manned spacecraft. Spacecraft: Gemini. COSPAR: 1966-099xx. During the ascent to orbit, the Gemini capsule atop the MOL Cannister was ejected and made a suborbital reentry and splashdown in the Atlantic Ocean. The spacecraft was the Gemini 2 reentry module, reused to test reentry with hatch cut into the heat shield. The capsule was successfully recovered and it was found that the reentry actually melted hatch shut, indicating that the design was valid for MOL. OV4-01R - . Mass: 109 kg (240 lb). Nation: USA. Agency: USAF. Class: Technology. Type: Navigation technology satellite. Spacecraft: OV4. Decay Date: 1967-01-05 . USAF Sat Cat: 2526 . COSPAR: 1966-099B. Apogee: 292 km (181 mi). Perigee: 289 km (179 mi). Inclination: 32.80 deg. Period: 90.30 min. Whispering gallery experiments. Space craft engaged in investigation of spaceflight techniques and technology (US Cat A)..
OV1-06S - . Mass: 202 kg (445 lb). Nation: USA. Agency: USAF. Class: Earth. Type: Magnetosphere satellite. Spacecraft: OV1. Decay Date: 1966-12-31 . USAF Sat Cat: 2527 . COSPAR: 1966-099C. Apogee: 290 km (180 mi). Perigee: 287 km (178 mi). Inclination: 32.80 deg. Period: 90.30 min. Space craft engaged in investigation of spaceflight techniques and technology (US Cat A). .
OV4-01T - . Mass: 109 kg (240 lb). Nation: USA. Agency: USAF. Class: Technology. Type: Navigation technology satellite. Spacecraft: OV4. Decay Date: 1967-01-11 . USAF Sat Cat: 2528 . COSPAR: 1966-099D. Apogee: 317 km (196 mi). Perigee: 289 km (179 mi). Inclination: 32.80 deg. Period: 90.60 min. Whispering gallery experiments. Space craft engaged in investigation of spaceflight techniques and technology (US Cat A). .
1967 January 18 - . 14:19 GMT - . Launch Site: Cape Canaveral. Launch Complex: Cape Canaveral LC41. LV Family: Titan. Launch Vehicle: Titan IIIC. IDCSP 2-1 - . Payload: IDCSP 8 / OPS 9321. Mass: 45 kg (99 lb). Nation: USA. Agency: USAF. Class: Communications. Type: Military communications satellite. Spacecraft: IDCSP. USAF Sat Cat: 2645 . COSPAR: 1967-003A. Apogee: 33,829 km (21,020 mi). Perigee: 33,518 km (20,827 mi). Inclination: 8.70 deg. Period: 1,329.50 min. Launched from Cape Canaveral, a Titan IIIC (Vehicle #13) space booster lifted eight 100-pound military communications satellites into synchronous orbits 21,000 miles above the equator. The satellites, together with the seven placed in orbit on 16 June 1966, formed the Initial Defense Satellite Communication System (IDSCS). Space craft engaged in investigation of spaceflight techniques and technology (US Cat A). IDCSP 2-7 - . Payload: IDCSP 14 / OPS 9327. Mass: 45 kg (99 lb). Nation: USA. Agency: USAF. Class: Communications. Type: Military communications satellite. Spacecraft: IDCSP. USAF Sat Cat: 2654 . COSPAR: 1967-003G. Apogee: 34,127 km (21,205 mi). Perigee: 33,622 km (20,891 mi). Inclination: 8.60 deg. Period: 1,339.50 min. Space craft engaged in investigation of spaceflight techniques and technology (US Cat A)..
IDCSP 2-3 - . Payload: IDCSP 10 / OPS 9323. Mass: 45 kg (99 lb). Nation: USA. Agency: USAF. Class: Communications. Type: Military communications satellite. Spacecraft: IDCSP. USAF Sat Cat: 2650 . COSPAR: 1967-003C. Apogee: 33,843 km (21,029 mi). Perigee: 33,549 km (20,846 mi). Inclination: 8.30 deg. Period: 1,330.70 min. Space craft engaged in investigation of spaceflight techniques and technology (US Cat A)..
IDCSP 2-4 - . Payload: IDCSP 11 / OPS 9324. Mass: 45 kg (99 lb). Nation: USA. Agency: USAF. Class: Communications. Type: Military communications satellite. Spacecraft: IDCSP. USAF Sat Cat: 2651 . COSPAR: 1967-003D. Apogee: 33,873 km (21,047 mi). Perigee: 33,579 km (20,864 mi). Inclination: 8.50 deg. Period: 1,332.10 min. Space craft engaged in investigation of spaceflight techniques and technology (US Cat A)..
IDCSP 2-8 - . Payload: IDCSP 15 / OPS 9328. Mass: 45 kg (99 lb). Nation: USA. Agency: USAF. Class: Communications. Type: Military communications satellite. Spacecraft: IDCSP. USAF Sat Cat: 2655 . COSPAR: 1967-003H. Apogee: 34,224 km (21,265 mi). Perigee: 33,666 km (20,919 mi). Inclination: 8.60 deg. Period: 1,343.10 min. IDCSP 2-5 - . Payload: IDCSP 12 / OPS 9325. Mass: 45 kg (99 lb). Nation: USA. Agency: USAF. Class: Communications. Type: Military communications satellite. Spacecraft: IDCSP. USAF Sat Cat: 2652 . COSPAR: 1967-003E. Apogee: 33,935 km (21,086 mi). Perigee: 33,599 km (20,877 mi). Inclination: 8.50 deg. Period: 1,334.20 min. Space craft engaged in investigation of spaceflight techniques and technology (US Cat A)..
IDCSP 2-2 - . Payload: IDCSP 9 / OPS 9322. Mass: 45 kg (99 lb). Nation: USA. Agency: USAF. Class: Communications. Type: Military communications satellite. Spacecraft: IDCSP. USAF Sat Cat: 2649 . COSPAR: 1967-003B. Apogee: 33,830 km (21,020 mi). Perigee: 33,533 km (20,836 mi). Inclination: 8.50 deg. Period: 1,329.90 min. Space craft engaged in investigation of spaceflight techniques and technology (US Cat A)..
IDCSP 2-6 - . Payload: IDCSP 13 / OPS 9326. Mass: 45 kg (99 lb). Nation: USA. Agency: USAF. Class: Communications. Type: Military communications satellite. Spacecraft: IDCSP. USAF Sat Cat: 2653 . COSPAR: 1967-003F. Apogee: 33,995 km (21,123 mi). Perigee: 33,631 km (20,897 mi). Inclination: 11.80 deg. Period: 1,336.50 min. Space craft engaged in investigation of spaceflight techniques and technology (US Cat A)..
1967 April 28 - . 10:01 GMT - . Launch Site: Cape Canaveral. Launch Complex: Cape Canaveral LC41. LV Family: Titan. Launch Vehicle: Titan IIIC. Vela 7 - . Payload: Vela 4A / OPS 6638. Mass: 317 kg (698 lb). Nation: USA. Agency: USAF. Class: Surveillance. Type: Nuclear detection surveillance satellite. Spacecraft: Advanced Vela. USAF Sat Cat: 2765 . COSPAR: 1967-040A. Apogee: 112,627 km (69,983 mi). Perigee: 108,948 km (67,697 mi). Inclination: 32.10 deg. Period: 6,652.10 min. Two new and heavier Vela Nuclear Detection Satellites and three scientific satellites were placed in orbit by a Titan IIIC (Vehicle #10) launched from Cape Canaveral. The two Vela satellites joined six other Vela spacecraft already on sentry duty 69,000 miles above the earth. Space craft engaged in investigation of spaceflight techniques and technology (US Cat A). OV5-01 - . Payload: ERS 27. Mass: 9.00 kg (19.80 lb). Nation: USA. Agency: USAF. Class: Earth. Type: Magnetosphere satellite. Spacecraft: OV5. USAF Sat Cat: 2769 . COSPAR: 1967-040E. Apogee: 110,746 km (68,814 mi). Perigee: 8,979 km (5,579 mi). Inclination: 32.80 deg. Period: 2,827.80 min. Materials research; deployed ERS 27. Space craft engaged in investigation of spaceflight techniques and technology (US Cat A). .
Vela 8 - . Payload: Vela 4B / OPS 6679. Mass: 317 kg (698 lb). Nation: USA. Agency: USAF. Class: Surveillance. Type: Nuclear detection surveillance satellite. Spacecraft: Advanced Vela. USAF Sat Cat: 2766 . COSPAR: 1967-040B. Apogee: 114,578 km (71,195 mi). Perigee: 107,372 km (66,717 mi). Inclination: 33.10 deg. Period: 6,668.10 min. ERS 18 - . Mass: 9.00 kg (19.80 lb). Nation: USA. Agency: USAF. Class: Earth. Type: Magnetosphere satellite. Spacecraft: ERS. USAF Sat Cat: 2767 . COSPAR: 1967-040C. Apogee: 110,842 km (68,873 mi). Perigee: 8,991 km (5,586 mi). Inclination: 0.00 deg. Period: 2,831.30 min. Radiation research. Space craft engaged in investigation of spaceflight techniques and technology (US Cat A). .
OV5-03 - . Payload: ERS 20. Mass: 9.00 kg (19.80 lb). Nation: USA. Agency: USAF. Class: Earth. Type: Magnetosphere satellite. Spacecraft: OV5. USAF Sat Cat: 2768 . COSPAR: 1967-040D. Apogee: 111,229 km (69,114 mi). Perigee: 8,604 km (5,346 mi). Inclination: 32.80 deg. Period: 2,829.60 min. Radiation research; deployed ERS 20. Space craft engaged in investigation of spaceflight techniques and technology (US Cat A). .
IDCSP 3-1 - . Payload: IDCSP 16 / OPS 9331. Mass: 45 kg (99 lb). Nation: USA. Agency: USAF. Class: Communications. Type: Military communications satellite. Spacecraft: IDCSP. USAF Sat Cat: 2862 . COSPAR: 1967-066A. Apogee: 33,515 km (20,825 mi). Perigee: 33,030 km (20,520 mi). Inclination: 11.90 deg. Period: 1,309.60 min. A Titan IIIC booster (Vehicle #14) launched from Cape Canaveral placed a multiple payload of six satellites into orbit. Three of the satellites completed the Pacific link of the Initial Defense Satellite Communication System (IDSCS) program between Washington D.C., and South Vietnam. A fourth was a special communications satellite, the Despun Antenna Test Satellite (DATS), designed to test a despun antenna system for possible use on future communications satellites. DATS was designed to transmit 75 percent of radio signal strength to earth stations compared to the 15 percent for previous systems. Also included in the payload were a Defense Department Gravity Gradient Experiment (DODGE) satellite and a Lincoln Experimental Satellite, LES-5, the first all solid-state Ultra-high Frequency (UHF) band communication satellite intended to test communications with frontline troops. Space craft engaged in investigation of spaceflight techniques and technology (US Cat A). IDCSP 3-3 - . Payload: IDCSP 18 / OPS 9333. Mass: 45 kg (99 lb). Nation: USA. Agency: USAF. Class: Communications. Type: Military communications satellite. Spacecraft: IDCSP. USAF Sat Cat: 2864 . COSPAR: 1967-066C. Apogee: 33,547 km (20,845 mi). Perigee: 33,079 km (20,554 mi). Inclination: 11.90 deg. Period: 1,311.60 min. Space craft engaged in investigation of spaceflight techniques and technology (US Cat A)..
IDCSP 3-2 - . Payload: IDCSP 17 / OPS 9332. Mass: 45 kg (99 lb). Nation: USA. Agency: USAF. Class: Communications. Type: Military communications satellite. Spacecraft: IDCSP. USAF Sat Cat: 2863 . COSPAR: 1967-066B. Apogee: 33,517 km (20,826 mi). Perigee: 33,046 km (20,533 mi). Inclination: 11.90 deg. Period: 1,310.00 min. Space craft engaged in investigation of spaceflight techniques and technology (US Cat A).. DODGE 1 - . Mass: 102 kg (224 lb). Nation: USA. Agency: USN NASC. Class: Technology. Type: Gravity gradient technology satellite. Spacecraft: DODGE. USAF Sat Cat: 2867 . COSPAR: 1967-066F. Apogee: 33,670 km (20,920 mi). Perigee: 33,257 km (20,664 mi). Inclination: 12.00 deg. Period: 1,319.10 min. A Titan IIIC booster (Vehicle #14) launched from Cape Canaveral placed a multiple payload of six satellites into orbit. Three of the satellites completed the Pacific link of the Initial Defense Satellite Communication System (IDSCS) program between Washington D.C., and South Vietnam. A fourth was a special communications satellite, the Despun Antenna Test Satellite (DATS), designed to test a despun antenna system for possible use on future communications satellites. DATS was designed to transmit 75 percent of radio signal strength to earth stations compared to the 15 percent for previous systems. Also included in the payload were a Defense Department Gravity Gradient Experiment (DODGE) satellite and a Lincoln Experimental Satellite, LES-5, the first all solid-state Ultra-high Frequency (UHF) band communication satellite intended to test communications with frontline troops. Gravity gradient experiments. Space craft engaged in investigation of spaceflight techniques and technology (US Cat A). IDCSP 3-4 - . Payload: IDCSP 19/DATS / OPS 9334. Mass: 68 kg (149 lb). Nation: USA. Agency: USAF. Class: Communications. Type: Military communications satellite. Spacecraft: IDCSP. USAF Sat Cat: 2865 . COSPAR: 1967-066D. Apogee: 33,560 km (20,850 mi). Perigee: 33,145 km (20,595 mi). Inclination: 11.90 deg. Period: 1,313.50 min. Antenna tests. Space craft engaged in investigation of spaceflight techniques and technology (US Cat A). .
1968 June 13 - . 14:03 GMT - . Launch Site: Cape Canaveral. Launch Complex: Cape Canaveral LC41. LV Family: Titan. Launch Vehicle: Titan IIIC. IDCSP 4-1 - . Payload: IDCSP 20 / OPS 9341. Mass: 45 kg (99 lb). Nation: USA. Agency: USAF. Class: Communications. Type: Military communications satellite. Spacecraft: IDCSP. USAF Sat Cat: 3284 . COSPAR: 1968-050A. Apogee: 33,850 km (21,030 mi). Perigee: 33,725 km (20,955 mi). Inclination: 11.90 deg. Period: 1,335.20 min. An Air Force Titan IIIC, Vehicle #16, was launched from Cape Canaveral and successfully inserted eight 100-pound communications satellites into near-synchronous orbits. These satellites augmented and completed the deployment of the Initial Defense Satellite Communications System (IDSCS) which now consisted of 26 operational satellites Space craft engaged in investigation of spaceflight techniques and technology (US Cat A). IDCSP 4-4 - . Payload: IDCSP 23 / OPS 9344. Mass: 45 kg (99 lb). Nation: USA. Agency: USAF. Class: Communications. Type: Military communications satellite. Spacecraft: IDCSP. USAF Sat Cat: 3287 . COSPAR: 1968-050D. Apogee: 33,939 km (21,088 mi). Perigee: 33,743 km (20,966 mi). Inclination: 9.20 deg. Period: 1,337.90 min. Space craft engaged in investigation of spaceflight techniques and technology (US Cat A)..
IDCSP 4-3 - . Payload: IDCSP 22 / OPS 9343. Mass: 45 kg (99 lb). Nation: USA. Agency: USAF. Class: Communications. Type: Military communications satellite. Spacecraft: IDCSP. USAF Sat Cat: 3286 . COSPAR: 1968-050C. Apogee: 33,901 km (21,065 mi). Perigee: 33,722 km (20,953 mi). Inclination: 9.40 deg. Period: 1,336.40 min. Space craft engaged in investigation of spaceflight techniques and technology (US Cat A)..
IDCSP 4-5 - . Payload: IDCSP 24 / OPS 9345. Mass: 45 kg (99 lb). Nation: USA. Agency: USAF. Class: Communications. Type: Military communications satellite. Spacecraft: IDCSP. USAF Sat Cat: 3288 . COSPAR: 1968-050E. Apogee: 34,035 km (21,148 mi). Perigee: 33,721 km (20,953 mi). Inclination: 7.40 deg. Period: 1,339.60 min. Space craft engaged in investigation of spaceflight techniques and technology (US Cat A)..
IDCSP 4-8 - . Payload: IDCSP 27 / OPS 9348. Mass: 45 kg (99 lb). Nation: USA. Agency: USAF. Class: Communications. Type: Military communications satellite. Spacecraft: IDCSP. USAF Sat Cat: 3291 . COSPAR: 1968-050H. Apogee: 34,442 km (21,401 mi). Perigee: 33,752 km (20,972 mi). Inclination: 7.70 deg. Period: 1,350.60 min. IDCSP 4-7 - . Payload: IDCSP 26 / OPS 9347. Mass: 45 kg (99 lb). Nation: USA. Agency: USAF. Class: Communications. Type: Military communications satellite. Spacecraft: IDCSP. USAF Sat Cat: 3290 . COSPAR: 1968-050G. Apogee: 34,256 km (21,285 mi). Perigee: 33,721 km (20,953 mi). Inclination: 7.50 deg. Period: 1,345.20 min. Space craft engaged in investigation of spaceflight techniques and technology (US Cat A)..
IDCSP 4-2 - . Payload: IDCSP 21 / OPS 9342. Mass: 45 kg (99 lb). Nation: USA. Agency: USAF. Class: Communications. Type: Military communications satellite. Spacecraft: IDCSP. USAF Sat Cat: 3285 . COSPAR: 1968-050B. Apogee: 33,863 km (21,041 mi). Perigee: 33,724 km (20,955 mi). Inclination: 7.40 deg. Period: 1,335.50 min. Space craft engaged in investigation of spaceflight techniques and technology (US Cat A)..
IDCSP 4-6 - . Payload: IDCSP 25 / OPS 9346. Mass: 45 kg (99 lb). Nation: USA. Agency: USAF. Class: Communications. Type: Military communications satellite. Spacecraft: IDCSP. USAF Sat Cat: 3289 . COSPAR: 1968-050F. Apogee: 34,118 km (21,199 mi). Perigee: 33,739 km (20,964 mi). Inclination: 9.40 deg. Period: 1,342.20 min. Space craft engaged in investigation of spaceflight techniques and technology (US Cat A)..
OV2-05 - . Mass: 204 kg (449 lb). Nation: USA. Agency: USAF. Class: Earth. Type: Magnetosphere satellite. Spacecraft: OV2. Completed Operations Date: 1968-09-01 . USAF Sat Cat: 3428 . COSPAR: 1968-081A. Apogee: 35,745 km (22,210 mi). Perigee: 35,113 km (21,818 mi). Inclination: 12.30 deg. Period: 1,417.90 min. A Titan ITIC space booster (Vehicle #5) was launched from Complex 41 at the Eastern Test Range and inserted four satellites into separate earth orbits. The primary payload was the Lincoln Experimental Satellite (LES-6) which was the second all-solid-state ultrahigh frequency (UHF) band communication satellite to be placed into a synchronous orbit. It was designed to test communications with aircraft, ships, and ground forces. The other three satellites were Office of Aerospace Research (OAR) payloads - two Experimental Research Satellites (ERS-21 and ERS-28) and an Orbiting Vehicle (OV 2-5) research satellite. Environmental research. Space craft engaged in investigation of spaceflight techniques and technology (US Cat A). As of 22 August 2001 located at 128.37 deg E drifting at 4.618 deg E per day. As of 2007 Feb 27 located at 91.48E drifting at 4.631E degrees per day. OV5-02 - . Payload: ERS 28. Mass: 10 kg (22 lb). Nation: USA. Agency: USAF. Class: Earth. Type: Magnetosphere satellite. Spacecraft: OV5. Decay Date: 1971-02-15 . USAF Sat Cat: 3429 . COSPAR: 1968-081B. Apogee: 35,786 km (22,236 mi). Perigee: 184 km (114 mi). Inclination: 26.40 deg. Period: 630.80 min. Particle radiation data. Space craft engaged in investigation of spaceflight techniques and technology (US Cat A). .
OV5-04 - . Payload: ERS 21. Mass: 13 kg (28 lb). Nation: USA. Agency: USAF. Class: Earth. Type: Magnetosphere satellite. Spacecraft: OV5. Completed Operations Date: 1968-09-01 . USAF Sat Cat: 3430 . COSPAR: 1968-081C. Apogee: 35,786 km (22,236 mi). Perigee: 35,775 km (22,229 mi). Inclination: 3.00 deg. Period: 1,435.80 min. Examined heat transfer in liquids in zero-g. Space craft engaged in investigation of spaceflight techniques and technology (US Cat A). Last known longitude (19 July 1995) 138.85 deg E drifting at 0.103 deg W per day..
1969 February 9 - . 21:09 GMT - . Launch Site: Cape Canaveral. Launch Complex: Cape Canaveral LC41. LV Family: Titan. Launch Vehicle: Titan IIIC. Tacsat 1 - . Mass: 730 kg (1,600 lb). Nation: USA. Agency: USAF. Class: Technology. Type: Communications technology satellite. Spacecraft Bus: HS 308. Spacecraft: Tacsat. Completed Operations Date: 1977-01-01 . USAF Sat Cat: 3691 . COSPAR: 1969-013A. Apogee: 36,044 km (22,396 mi). Perigee: 35,939 km (22,331 mi). Inclination: 1.00 deg. Period: 1,446.60 min. Air Force Titan IIIC, Vehicle #17, was launched from Cape Canaveral and placed the 1,600-pound experimental Tactical Communications Satellite, TACSAT I, into a near-synchronous orbit at an altitude of 19,300 nautical miles above the equator. TACSAT I, built by Hughes Aircraft Company under SAMSO management, was the largest communications satellite yet launched and placed in orbit by the United States. It was to determine the feasibility of using satellite communications repeaters with small mobile ground tactical communications equipment. In addition, using the technology already developed with earlier Despun Antenna Test System (DATS) and Lincoln Experimental Satellites (LES) test spacecraft, TACSAT I would test the feasibility of satellite communications over great distances while also testing the new gyrostat stabilization system. The satellite could handle transmission of television or multiple telephone/ teletype communications channels. Experimental commsat. Space craft engaged in investigation of spaceflight techniques and technology (US Cat A). Positioned in geosynchronous orbit over the Americas at 107 deg W in 1969?-1970; over the Pacific Ocean 173 deg W in 1970; over the Pacific Ocean 179 deg W in 1971-1972; over the Pacific Ocean170 deg E in 1972 Last known longitude (9 June 1995) 176.44 deg E drifting at 0.150 deg E per day. 1969 May 23 - . 07:57 GMT - . Launch Site: Cape Canaveral. Launch Complex: Cape Canaveral LC41. LV Family: Titan. Launch Vehicle: Titan IIIC. OV5-05 - . Payload: ERS 29. Mass: 259 kg (570 lb). Nation: USA. Agency: USAF. Class: Earth. Type: Magnetosphere satellite. Spacecraft: OV5. USAF Sat Cat: 3950 . COSPAR: 1969-046A. Apogee: 69,130 km (42,950 mi). Perigee: 59,630 km (37,050 mi). Inclination: 33.00 deg. Period: 3,121.90 min. The 13th, and final, Titan IIIC research and development booster (Vehicle #15) lifted two Vela satellites, the fifth pair of such nuclear detection spacecraft, and three experimental satellites into orbit from Cape Canaveral. This launch concluded the highly successful Titan III research and development program initiated in 1962. Out of 13 Titan IIIC and four Titan IITA vehicles launched, 10 Titan IITCs were complete successes, two were partial successes, and only one was a failure, while three of the four Titan IITA launches were rated successful. Space craft engaged in investigation of spaceflight techniques and technology (US Cat A). OV5-06 - . Payload: ERS 26. Mass: 259 kg (570 lb). Nation: USA. Agency: USAF. Class: Earth. Type: Magnetosphere satellite. Spacecraft: OV5. USAF Sat Cat: 3951 . COSPAR: 1969-046B. Apogee: 69,022 km (42,888 mi). Perigee: 59,540 km (36,990 mi). Inclination: 33.60 deg. Period: 3,115.40 min. Space craft engaged in investigation of spaceflight techniques and technology (US Cat A)..
Vela 9 - . Payload: Vela 5A / OPS 6909. Mass: 317 kg (698 lb). Nation: USA. Agency: USAF. Class: Surveillance. Type: Nuclear detection surveillance satellite. Spacecraft: Advanced Vela. Decay Date: 1992-12-31 . USAF Sat Cat: 3954 . COSPAR: 1969-046D. Apogee: 145,638 km (90,495 mi). Perigee: 77,082 km (47,896 mi). Inclination: 61.60 deg. Period: 6,700.90 min. Solar flare particle detectors. Space craft engaged in investigation of spaceflight techniques and technology (US Cat A). .
Vela 10 - . Payload: Vela 5B / OPS 6911. Mass: 317 kg (698 lb). Nation: USA. Agency: USAF. Class: Surveillance. Type: Nuclear detection surveillance satellite. Spacecraft: Advanced Vela. Decay Date: 1992-12-31 . USAF Sat Cat: 3955 . COSPAR: 1969-046E. Apogee: 150,633 km (93,598 mi). Perigee: 72,080 km (44,780 mi). Inclination: 61.00 deg. Period: 6,700.70 min. The 13th, and final, Titan IIIC research and development booster (Vehicle #15) lifted two Vela satellites, the fifth pair of such nuclear detection spacecraft, and three experimental satellites into orbit from Cape Canaveral. This launch concluded the highly successful Titan III research and development program initiated in 1962. Out of 13 Titan IIIC and four Titan IITA vehicles launched, 10 Titan IITCs were complete successes, two were partial successes, and only one was a failure, while three of the four Titan IITA launches were rated successful. Radiation, low-energy particle, solar flare data. Space craft engaged in investigation of spaceflight techniques and technology (US Cat A). OV5-09 - . Mass: 11 kg (24 lb). Nation: USA. Agency: USAF. Class: Earth. Type: Magnetosphere satellite. Spacecraft: OV5. USAF Sat Cat: 3952 . COSPAR: 1969-046C. Apogee: 69,011 km (42,881 mi). Perigee: 59,543 km (36,998 mi). Inclination: 33.50 deg. Period: 3,115.10 min. VLF plasma wave detection. Space craft engaged in investigation of spaceflight techniques and technology (US Cat A). .
1970 February 13 - . Launch Site: Cape Canaveral. LV Family: Titan. Launch Vehicle: Titan IIIC. Spacecraft Environment Enclosure for Titan IIIC - . Work was completed on the new, highly sophisticated spacecraft Environment Enclosure for the Titan IIIC facilities at Launch Complex 40 at Cape Canaveral. The $1.6 million enclosure on the Mobile Service Tower (MST) would provide a temperature and humidity controlled environment for a variety of spacecraft to be orbited by the Titan IIIC. This would allow crews to adjust or repair spacecraft without removing them from the MST. Official Air Force acceptance was announced on 12 March 1970. 1970 April 8 - . 10:50 GMT - . Launch Site: Cape Canaveral. Launch Complex: Cape Canaveral LC40. LV Family: Titan. Launch Vehicle: Titan IIIC. Vela 12 - . Payload: Vela 6A / OPS 7044. Mass: 317 kg (698 lb). Nation: USA. Agency: USAF. Class: Surveillance. Type: Nuclear detection surveillance satellite. Spacecraft: Advanced Vela. Decay Date: 1992-12-31 . USAF Sat Cat: 4366 . COSPAR: 1970-027A. Apogee: 121,227 km (75,326 mi). Perigee: 101,261 km (62,920 mi). Inclination: 61.20 deg. Period: 6,691.00 min. Space craft engaged in investigation of spaceflight techniques and technology (US Cat A)..
Vela 11 - . Payload: Vela 6B / OPS 7033. Mass: 317 kg (698 lb). Nation: USA. Agency: USAF. Class: Surveillance. Type: Nuclear detection surveillance satellite. Spacecraft: Advanced Vela. Decay Date: 1992-12-31 . USAF Sat Cat: 4368 . COSPAR: 1970-027B. Apogee: 119,313 km (74,137 mi). Perigee: 103,570 km (64,350 mi). Inclination: 57.40 deg. Period: 6,707.90 min. Space craft engaged in investigation of spaceflight techniques and technology (US Cat A)..
1970 May 15 - . Launch Site: , Vandenberg. LV Family: Titan. Launch Vehicle: Titan IIIC. Construction completed at SLC-4E - . Facility construction was completed at the Titan III launch pad, Space Launch Complex 4 East (SLC-4E) at Vandenberg. The new facilities provided a temperature and humidity controlled environment for payloads that were to be flown aboard the Titan III launch vehicles. 1970 November 6 - . 10:35 GMT - . Launch Site: Cape Canaveral. Launch Complex: Cape Canaveral LC40. LV Family: Titan. Launch Vehicle: Titan IIIC. FAILURE: Partial Failure.. Failed Stage: U.
IMEWS 1 - . Payload: DSP Phase 1 s/n 1 / OPS 5960. Mass: 900 kg (1,980 lb). Nation: USA. Agency: USAF. Class: Surveillance. Type: Early warning satellite. Spacecraft: DSP. Completed Operations Date: 1973-12-31 . USAF Sat Cat: 4630 . COSPAR: 1970-093A. Apogee: 36,128 km (22,448 mi). Perigee: 25,840 km (16,050 mi). Inclination: 16.40 deg. Period: 1,197.90 min. An Air Force Titan IIIC launched the 500th satellite to be placed in orbit successfully by a vehicle launched from Cape Canaveral. First generation geosynchronous ballistic missile launch detection satellite; placed in incorrect subsynchronous orbit. One account claimed that it exhausted its propellant before it could be put into operation, but a 2007service history chart showed that is was considered operational for three years, well beyond its planned life. 1971 May 5 - . 07:43 GMT - . Launch Site: Cape Canaveral. Launch Complex: Cape Canaveral LC40. LV Family: Titan. Launch Vehicle: Titan IIIC. IMEWS 2 - . Payload: DSP Phase 1 s/n 2 / OPS 3811. Mass: 900 kg (1,980 lb). Nation: USA. Agency: USAF. Class: Surveillance. Type: Early warning satellite. Spacecraft: DSP. Completed Operations Date: 1983-01-10 . USAF Sat Cat: 5204 . COSPAR: 1971-039A. Apogee: 36,527 km (22,696 mi). Perigee: 36,156 km (22,466 mi). Inclination: 10.50 deg. Period: 1,464.60 min. First generation geosynchronous ballistic missile launch detection satellite. First completely sucessful operational satellite, remained in service for nearly 12 years. Positioned over the Indian Ocean at 75 deg E in 1979-1982. As of 1983 May 11 located at 73.28W drifting at 7.684W degrees per day. 1971 November 3 - . 03:09 GMT - . Launch Site: Cape Canaveral. Launch Complex: Cape Canaveral LC40. LV Family: Titan. Launch Vehicle: Titan IIIC. DSCS II-01 - . Payload: DSCS II F-1 / OPS 9431. Mass: 520 kg (1,140 lb). Nation: USA. Agency: USAF. Program: DSCS. Class: Communications. Type: Military communications satellite. Spacecraft: DSCS II. Completed Operations Date: 1979-05-01 . USAF Sat Cat: 5587 . COSPAR: 1971-095A. Apogee: 35,815 km (22,254 mi). Perigee: 35,765 km (22,223 mi). Inclination: 13.80 deg. Period: 1,436.30 min. A Titan IIIC, launched from Cape Canaveral, placed into synchronous orbits the first pair of 1,200-pound advanced communications satellites of the Defense Satellite Communication System Phase II (DSCS II). After some initial difficulties with the satellites, telemetry and command links were established with both satellites by 5 November. Under SAMSO program management, TRW Systems Group manufactured these second generation communications satellites that were intended as replacements for the 26-satellite Initial Defense Satellite Communication Systems (IDSCS). Each of the DSCS II (Program 777) satellites would be able to handle voice, teletype, computerized digital data, and video transmissions. Defense Satellite Communications System. Space craft engaged in investigation of spaceflight techniques and technology (US Cat A). Positioned in geosynchronous orbit over the Americas at 106 deg W in 1972-? ; over the Americas at 81 deg W in 1977-1979; over the Americas at 100-110 deg W in drift 1979-1998 As of 1 September 2001 located at 103.05 deg W drifting at 0.044 deg W per day. As of 2007 Mar 9 located at 110.10W drifting at 0.035W degrees per day. DSCS II-02 - . Payload: DSCS II F-2 / OPS 9432. Mass: 520 kg (1,140 lb). Nation: USA. Agency: USAF. Program: DSCS. Class: Communications. Type: Military communications satellite. Spacecraft: DSCS II. Completed Operations Date: 1972-01-01 . USAF Sat Cat: 5588 . COSPAR: 1971-095B. Apogee: 35,824 km (22,259 mi). Perigee: 35,819 km (22,256 mi). Inclination: 13.60 deg. Period: 1,437.90 min. Defense Satellite Communications System. Space craft engaged in investigation of spaceflight techniques and technology (US Cat A). Positioned in geosynchronous orbit over the Americas at 112 deg W in 1972. As of 30 August 2001 located at 146.34 deg E drifting at 0.101 deg W per day. As of 2007 Mar 5 located at 36.33W drifting at 0.201E degrees per day. 1972 March 1 - . 09:39 GMT - . Launch Site: Cape Canaveral. Launch Complex: Cape Canaveral LC40. LV Family: Titan. Launch Vehicle: Titan IIIC. IMEWS 3 - . Payload: DSP Phase 1 s/n 3 / OPS 1570. Mass: 900 kg (1,980 lb). Nation: USA. Agency: USAF. Class: Surveillance. Type: Early warning satellite. Spacecraft: DSP. Completed Operations Date: 1981-08-03 . USAF Sat Cat: 5851 . COSPAR: 1972-010A. Apogee: 35,962 km (22,345 mi). Perigee: 35,416 km (22,006 mi). Inclination: 0.20 deg. Period: 1,429.90 min. First generation geosynchronous ballistic missile launch detection satellite, remained in service for over nine years. Positioned over the Pacific Ocean at 165 deg E in 1979-1980. As of 2003 Mar 5 located at 74.63E drifting at 0.712W degrees per day..
1973 June 12 - . 07:14 GMT - . Launch Site: Cape Canaveral. Launch Complex: Cape Canaveral LC40. LV Family: Titan. Launch Vehicle: Titan IIIC. IMEWS 4 - . Payload: DSP Phase 1 s/n 4 / OPS 6157. Mass: 900 kg (1,980 lb). Nation: USA. Agency: USAF. Class: Surveillance. Type: Early warning satellite. Spacecraft: DSP. Completed Operations Date: 1980-11-01 . USAF Sat Cat: 6691 . COSPAR: 1973-040A. Apogee: 35,786 km (22,236 mi). Perigee: 35,777 km (22,230 mi). Inclination: 0.30 deg. Period: 1,435.90 min. First generation geosynchronous ballistic missile launch detection satellite, remained in service for over seven years. Positioned in geosynchronous orbit over the Indian Ocean at 75E in 1973; over the Americas at 105 deg W in 1979-1980. As of 1983 Jan 3 located at 73.21W drifting at 1.648W degrees per day. 1973 December 13 - . 23:57 GMT - . Launch Site: Cape Canaveral. Launch Complex: Cape Canaveral LC40. LV Family: Titan. Launch Vehicle: Titan IIIC. DSCS II-03 - . Payload: DSCS II F-3 / OPS 9433. Mass: 566 kg (1,247 lb). Nation: USA. Agency: USAF. Program: DSCS. Class: Communications. Type: Military communications satellite. Spacecraft: DSCS II. Completed Operations Date: 1982-08-01 . USAF Sat Cat: 6973 . COSPAR: 1973-100A. Apogee: 36,661 km (22,780 mi). Perigee: 36,413 km (22,625 mi). Inclination: 13.90 deg. Period: 1,474.60 min. An Air Force Titan IIIC, launched by the 6555th Aerospace Test Group from the Eastern Test Range, boosted two Program 777 Defense Satellite Communications Systems; 13 deg W. A new inertial guidance system, manufactured by Delco Electronics for the Titan IIIC made its first flight. The new system consisted of an inertial measurement unit and a missile guidance computer. Spacecraft engaged in practical applications and uses of space technology such as weather or communication (US Cat C). Positioned in geosynchronous orbit over the Atlantic Ocean at 13 deg W in 1974-1977; over the Atlantic Ocean 57-66 deg W in 1977-1979 As of 3 September 2001 located at 104.01 deg E drifting at 9.429 deg W per day. As of 2007 Mar 9 located at 148.24W drifting at 9.427W degrees per day. DSCS II-04 - . Payload: DSCS II F-4 / OPS 9434. Mass: 566 kg (1,247 lb). Nation: USA. Agency: USAF. Program: DSCS. Class: Communications. Type: Military communications satellite. Spacecraft: DSCS II. Completed Operations Date: 1993-12-20 . USAF Sat Cat: 6974 . COSPAR: 1973-100B. Apogee: 36,837 km (22,889 mi). Perigee: 36,300 km (22,500 mi). Inclination: 13.50 deg. Period: 1,476.30 min. Defense Satellite Communications System; 175 deg E. Spacecraft engaged in practical applications and uses of space technology such as weather or communication (US Cat C). Positioned in geosynchronous orbit over the Pacific Ocean at 175 deg E in 1974-1977; over the Indian Ocean 65 deg E in 1977-1980; over the Indian Ocean 60-61 deg E in 1980-1984; over the Indian Ocean 66 deg E in 1984-1987; over the Americas at 56-62 deg W in 1989-1993 As of 5 September 2001 located at 138.02 deg W drifting at 9.919 deg W per day. As of 2007 Mar 3 located at 146.85E drifting at 9.914W degrees per day. 1974 May 30 - . 13:00 GMT - . Launch Site: Cape Canaveral. Launch Complex: Cape Canaveral LC40. LV Family: Titan. Launch Vehicle: Titan IIIC. ATS 6 - . Payload: ATS F. Mass: 930 kg (2,050 lb). Nation: USA. Agency: NASA Greenbelt. Program: ATS. Class: Technology. Type: Communications technology satellite. Spacecraft Bus: ATS. Spacecraft: ATS-6. Completed Operations Date: 1979-08-02 . USAF Sat Cat: 7318 . COSPAR: 1974-039A. Apogee: 35,444 km (22,023 mi). Perigee: 35,184 km (21,862 mi). Inclination: 13.10 deg. Period: 1,412.00 min. An Air Force Titan IIIC boosted NASA's Applications Technology Satellite (ATS-F) into orbit from Cape Canaveral. Built by Application Technology Satellite; experimental communications satellite. The purpose of the ATS-6 flight experiment was to demonstrate north-south stationkeeping of a geosynchronous satellite using two cesium ion engine systems. Thruster development tests included a life test of 2614 hours and 471 cycles. Thruster input power was 0.15 kW, which resulted in a thrust of 4.5 mN at a specific impulse of 2500 s. One of the ion engines operated for about one hour and the other for 92 hours. Both of the engines failed to provide thrust on restart due to discharge chamber cesium flooding. The feed system flooding problem caused overloading of the discharge and high voltage power supplies. This failure mechanism was verified through a series of ground tests. However engine operation demonstrated an absence of EMI related to spacecraft systems, verified predictions of spacecraft potential with engines operating, and demonstrated compatibility with the spacecraft's star tracker. It was found that the ion engines or just the neutralizer could discharge large negative spacecraft potentials at all times. Positioned in geosynchronous orbit over the Americas at 94 deg W in 1974-1975; over the Indian Ocean 35 deg E in 1975-1976; over the Americas at 140 deg W in 1976-1979. As of 2 September 2001 located at 172.56 deg W drifting at 6.144 deg E per day. As of 2007 Mar 8 located at 29.12W drifting at 6.125E degrees per day. 1975 May 20 - . 14:03 GMT - . Launch Site: Cape Canaveral. Launch Complex: Cape Canaveral LC40. LV Family: Titan. Launch Vehicle: Titan IIIC. FAILURE: Transtage gyro platform lost power; attitude control lost; orbit too low.. Failed Stage: U.
DSCS II-05 - . Payload: DSCS II F-5 / OPS 9435. Mass: 566 kg (1,247 lb). Nation: USA. Agency: USAF. Program: DSCS. Class: Communications. Type: Military communications satellite. Spacecraft: DSCS II. Decay Date: 1975-05-26 . USAF Sat Cat: 7807 . COSPAR: 1975-040A. Apogee: 256 km (159 mi). Perigee: 160 km (90 mi). Inclination: 28.60 deg. Period: 88.60 min. The third pair of Defense Satellite Communications System II satellites was launched; the launch failed due to a malfunction in the Transtage of the Titan IIIC launch vehicle. Unusable orbit. Space craft engaged in investigation of spaceflight techniques and technology (US Cat A). DSCS II-06 - . Payload: DSCS II F-6 / OPS 9436. Mass: 566 kg (1,247 lb). Nation: USA. Agency: USAF. Program: DSCS. Class: Communications. Type: Military communications satellite. Spacecraft: DSCS II. Decay Date: 1975-05-26 . USAF Sat Cat: 7808 . COSPAR: 1975-040B. Apogee: 256 km (159 mi). Perigee: 160 km (90 mi). Inclination: 28.60 deg. Period: 88.60 min. 1975 December 14 - . 05:15 GMT - . Launch Site: Cape Canaveral. Launch Complex: Cape Canaveral LC40. LV Family: Titan. Launch Vehicle: Titan IIIC. IMEWS 5 - . Payload: DSP Phase 2 s/n 7 / OPS 3165. Mass: 1,040 kg (2,290 lb). Nation: USA. Agency: USAF. Class: Surveillance. Type: Early warning satellite. Spacecraft: DSP. Completed Operations Date: 1987-12-31 . USAF Sat Cat: 8482 . COSPAR: 1975-118A. Apogee: 35,785 km (22,235 mi). Perigee: 35,671 km (22,164 mi). Inclination: 3.00 deg. Period: 1,436.00 min. Second generation geosynchronous ballistic missile launch detection satellite, remained in service for over twelve years. As of 1982 Dec 16 located at 34.61E drifting at 0.823E degrees per day..
1976 June 26 - . 03:00 GMT - . Launch Site: Cape Canaveral. Launch Complex: Cape Canaveral LC40. LV Family: Titan. Launch Vehicle: Titan IIIC. IMEWS 6 - . Payload: DSP Phase 2 s/n 8 / OPS 2112. Mass: 1,040 kg (2,290 lb). Nation: USA. Agency: USAF. Class: Surveillance. Type: Early warning satellite. Spacecraft: DSP. Completed Operations Date: 1984-07-01 . USAF Sat Cat: 8916 . COSPAR: 1976-059A. Apogee: 35,860 km (22,280 mi). Perigee: 35,620 km (22,130 mi). Inclination: 0.50 deg. Period: 1,433.30 min. Second generation geosynchronous ballistic missile launch detection satellite, remained in service for over eight years. Positioned over the Atlantic Ocean from 1976 to 1981: at 35 deg W in 1976-1977; at 65 deg W in 1977-1979; and 35 deg W in 1979-1980; and 65 deg W in 1980-1981. Then moved over the Pacific Ocean at 125 deg W, then 140 deg W in 1981-1982; then over the Indian Ocean at 75 deg E in 1982-1984. 1976 June 30 - . LV Family: Titan. Launch Vehicle: Titan IIIC. Improved injector for the Titan IIIC Transtage. - . A contract for the development of an improved injector for the Titan IIIC Transtage was distributed to the Aerojet Liquid Rocket Company; it carried a target price of $4.82 million..
1976 July 2 - . LV Family: Titan. Launch Vehicle: Titan IIIC. Contract for Titan III launch services. - . A contract was distributed to Martin Marietta for Titan III launch services from July 1976 to September 1978; the value of the contract was $80.47 million..
1976 July 23 - . LV Family: Titan. Launch Vehicle: Titan IIIC. Contract for five sets of Titan III solid rocket motors. - . A contract was distributed to Chemical Systems Division of United Technologies Corporation for five sets of Titan III solid rocket motors to be delivered at a price of $50.31 million..
1976 October 6 - . LV Family: Titan. Launch Vehicle: Titan IIIC. Contract for three Transtage engines and ten sets of Titan III Stage I and Stage II engines. - . A contract was distributed to Aerojet Liquid Rocket Company for three Transtage engines and ten sets of Titan III Stage I and Stage II engines, to be delivered at a price of $36.57 million..
1976 Dec - . LV Family: Titan, Shuttle. 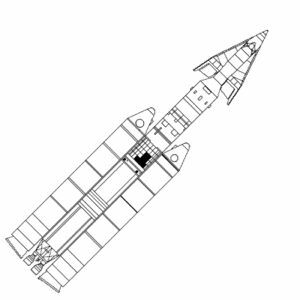 Launch Vehicle: Titan IIIC, Shuttle. Process selected for manufacturing hydrazine fuels for the Titan III and the space shuttle. - . SAMSO selected the Sisler process as the best of three competing methods for manufacturing hydrazine fuels for the Titan III and the space shuttle..
1976 December 3 - . LV Family: Titan. Launch Vehicle: Titan IIIC. Negotiations for eight new Titan III launch vehicles. - . Negotiations were completed between SAMSO and Martin Marietta for procurement of eight new Titan III launch vehicles.These were to be delivered by 30 September 1980 at a price of $79.35 million..
1976 December 6 - . LV Family: Titan. Launch Vehicle: Titan IIIC. Three Titan IIIC payload fairings contracted - . SAMSO completed negotiations with McDonnell Douglas for the procurement of three Titan IIIC payload fairings at a price of $3.25 million..
1977 Jan - . LV Family: Titan. Launch Vehicle: Titan IIIC. Contract for three payload fairings for Titan IIIC. - . The McDonnell Douglas Astronautics Company went on contract to provide three payload fairings for the Titan IIIC..
1977 February 6 - . 06:00 GMT - . Launch Site: Cape Canaveral. Launch Complex: Cape Canaveral LC40. LV Family: Titan. Launch Vehicle: Titan IIIC. IMEWS 7 - . Payload: DSP Phase 2 s/n 9 / OPS 3151. Mass: 1,040 kg (2,290 lb). Nation: USA. Agency: USAF. Class: Surveillance. Type: Early warning satellite. Spacecraft: DSP. Completed Operations Date: 1984-01-01 . USAF Sat Cat: 9803 . COSPAR: 1977-007A. Apogee: 35,860 km (22,280 mi). Perigee: 35,620 km (22,130 mi). Inclination: 0.50 deg. Period: 1,433.30 min. Second generation geosynchronous ballistic missile launch detection satellite, remained in service for nearly seven years. Positioned in geosynchronous orbit over the Pacific Ocean at 135 deg W in 1977-1979; over the Indian Ocean 70 deg E in 1979-1984..
1977 May 12 - . 14:26 GMT - . Launch Site: Cape Canaveral. Launch Complex: Cape Canaveral LC40. LV Family: Titan. Launch Vehicle: Titan IIIC. DSCS II-07 - . Payload: DSCS II F-7 / OPS 9437. Mass: 565 kg (1,245 lb). Nation: USA. Agency: USAF. Program: DSCS. Class: Communications. Type: Military communications satellite. Spacecraft: DSCS II. Completed Operations Date: 1981-12-20 . USAF Sat Cat: 10000 . COSPAR: 1977-034A. Apogee: 36,894 km (22,924 mi). Perigee: 36,759 km (22,840 mi). Inclination: 15.80 deg. Period: 1,489.60 min. A Titan IIIC launched a pair of DSCS II satellites into orbit from Cape Canaveral, Florida. Spacecraft engaged in practical applications and uses of space technology such as weather or communication (US Cat C). Positioned in geosynchronous orbit over the Atlantic Ocean at 12 deg W in 1977-1979; over the Atlantic Ocean 5 deg W in 1979; over the Pacific Ocean 140 deg E in 1980-1981 As of 28 August 2001 located at 152.07 deg W drifting at 12.959 deg W per day. As of 2007 Mar 10 located at 47.37W drifting at 12.959W degrees per day. DSCS II-08 - . Payload: DSCS II F-8 / OPS 9438. Mass: 565 kg (1,245 lb). Nation: USA. Agency: USAF. Program: DSCS. Class: Communications. Type: Military communications satellite. Spacecraft: DSCS II. Completed Operations Date: 1990-02-01 . USAF Sat Cat: 10001 . COSPAR: 1977-034B. Apogee: 37,343 km (23,203 mi). Perigee: 37,061 km (23,028 mi). Inclination: 15.50 deg. Period: 1,509.00 min. A Titan IIIC launched a pair of DSCS II satellites into orbit from Cape Canaveral, Florida. Spacecraft engaged in practical applications and uses of space technology such as weather or communication (US Cat C). Positioned in geosynchronous orbit over the Pacific Ocean at 175 deg E in 1977-1979 over the Atlantic Ocean 12 deg W in 1979-80 over the Pacific Ocean 175 deg E in 1980-1983 over the Pacific Ocean180 deg E in 1983-1986 over the Atlantic Ocean 1 deg W in 1986-1989 As of 3 September 2001 located at 143.55 deg W drifting at 17.451 deg W per day. As of 2007 Mar 9 located at 13.13E drifting at 17.445W degrees per day. 1977 Jun - . LV Family: Titan. Launch Vehicle: Titan IIIC. Contract for five sets of solid rocket motors for the Titan III. - . Chemical Systems Division of United Technologies Corporation went on contract to provide five sets of solid rocket motors for the Titan III..
1977 November 11 - . LV Family: Titan. Launch Vehicle: Titan IIIC. Launch services for Titan III solid rocket motors. - . Chemical Systems Division of United Technologies Corporation was awarded a contract to provide launch services for Titan III solid rocket motors..
1977 November 16 - . LV Family: Titan. Launch Vehicle: Titan IIIC. Launch services for Titan III liquid rocket engines. - . The Aerojet Liquid Rocket Company was awarded a contract to provide launch services for Titan III liquid rocket engines..
1978 March 25 - . 18:09 GMT - . Launch Site: Cape Canaveral. Launch Complex: Cape Canaveral LC40. LV Family: Titan. Launch Vehicle: Titan IIIC. FAILURE: Second stage hydraulic pump failure.. Failed Stage: 2. DSCS II-09 - . Payload: DSCS II F-9. Mass: 550 kg (1,210 lb). Nation: USA. Agency: USAF. Program: DSCS. Class: Communications. Type: Military communications satellite. Spacecraft: DSCS II. Decay Date: 1978-03-25 . A Titan IIIC was launched from Cape Canaveral carrying DSCS II satellites F-9 and F-10. The vehicle suffered a failure in its second stage hydraulic system about eight minutes after liftoff, and both the vehicle and its payload were lost. Launched with DSCS F10. DSCS II F-10 - . Payload: DSCS II F-10. Mass: 562 kg (1,238 lb). Nation: USA. Agency: USAF AFSC. Program: DSCS. Spacecraft: DSCS II. A Titan IIIC was launched from Cape Canaveral carrying DSCS II satellites F-9 and F-10. The vehicle suffered a failure in its second stage hydraulic system about eight minutes after liftoff, and both the vehicle and its payload were lost. .
1978 May 2 - . LV Family: Titan. Launch Vehicle: Titan IIIC. Report on Titan IIIC launch failure of 25 March 1978. - . Spacecraft: DSCS II. The AFSC Missile Mishap Investigation Board, investigating the failure of a Titan IIIC launch of DSCS II satellites on 25 March, submitted its final report..
1978 Jul - . LV Family: Titan. Launch Vehicle: Titan IIIC. Improved transtage injectors. - . Aerojet Liquid Rocket Company delivered the first three Titan IIIC Transtage engines fitted with improved transtage injectors..
1978 September 26 - . LV Family: Titan. Launch Vehicle: Titan IIIC. Production of a new rocket motor test set for the Titan III. - . SAMSO initiated production of a new rocket motor test set for the Titan III. The rocket motor test set was developed by Chemical Systems Division..
1978 Oct - . LV Family: Titan. Launch Vehicle: Titan IIIC. Titan III launch support - . SAMSO awarded a contract for Titan III launch support to Martin Marietta's Denver Division..
1978 November 11 - . Launch Site: Cape Canaveral. LV Family: Titan. Launch Vehicle: Titan IIIC. Titan III ground control computers replaced - . Final checkout of Programmable Aerospace Control Equipment (PACE) installed at Cape Canaveral took place. PACE was developed by Martin Marietta to replace obsolete Titan III ground control computers..
1978 December 14 - . 00:43 GMT - . Launch Site: Cape Canaveral. Launch Complex: Cape Canaveral LC40. LV Family: Titan. Launch Vehicle: Titan IIIC. DSCS II-11 - . Payload: DSCS II F-11 / OPS 9441. Mass: 550 kg (1,210 lb). Nation: USA. Agency: USAF. Program: DSCS. Class: Communications. Type: Military communications satellite. Spacecraft: DSCS II. Completed Operations Date: 1993-12-13 . USAF Sat Cat: 11144 . COSPAR: 1978-113A. Apogee: 37,749 km (23,456 mi). Perigee: 37,515 km (23,310 mi). Inclination: 9.80 deg. Period: 1,531.40 min. A Titan IIIC was launched from Cape Canaveral carrying DSCS II satellites F-ll and F-12. The vehicle placed the satellites in the proper orbit, and the satellites performed normally once there. They were expected to go into operation in mid-January 1979, at which point the DSCS II system would have a full, four-satellite constellation at its disposal for the first time in its history. Spacecraft engaged in practical applications and uses of space technology such as weather or communication (US Cat C). Positioned in geosynchronous orbit over the Pacific Ocean at 135 deg W in 1979-1983 over the Pacific Ocean 129 deg W in 1983-1989 As of 5 September 2001 located at 62.62 deg W drifting at 22.467 deg W per day. As of 2007 Mar 10 located at 96.59E drifting at 22.469W degrees per day. DSCS II-12 - . Payload: DSCS II F-12 / OPS 9442. Mass: 550 kg (1,210 lb). Nation: USA. Agency: USAF. Program: DSCS. Class: Communications. Type: Military communications satellite. Spacecraft: DSCS II. Completed Operations Date: 1993-12-13 . USAF Sat Cat: 11145 . COSPAR: 1978-113B. Apogee: 36,332 km (22,575 mi). Perigee: 36,283 km (22,545 mi). Inclination: 9.80 deg. Period: 1,462.80 min. Spacecraft engaged in practical applications and uses of space technology such as weather or communication (US Cat C). Positioned in geosynchronous orbit over the Pacific Ocean at 175 deg E in 1979-1981 over the Indian Ocean 66 deg E in 1981-1983 over the Indian Ocean 60 deg E in 1983-1987 over the Pacific Ocean177 deg E in 1988-1989 over the Indian Ocean 71 deg E in 1990-1992 As of 1 September 2001 located at 93.28 deg E drifting at 6.600 deg W per day. As of 2007 Mar 8 located at 143.60E drifting at 6.589W degrees per day. 1979 June 10 - . 13:39 GMT - . Launch Site: Cape Canaveral. Launch Complex: Cape Canaveral LC40. LV Family: Titan. Launch Vehicle: Titan IIIC. IMEWS 10 - . Payload: DSP MOS/PIM s/n 11 / OPS 7484. Mass: 1,170 kg (2,570 lb). Nation: USA. Agency: USAF. Class: Surveillance. Type: Early warning satellite. Spacecraft: DSP. Completed Operations Date: 1984-06-01 . USAF Sat Cat: 11397 . COSPAR: 1979-053A. Apogee: 35,854 km (22,278 mi). Perigee: 35,712 km (22,190 mi). Inclination: 1.80 deg. Period: 1,435.90 min. First Multi-Orbit Satellite / Performance Improvement ballistic missile launch detection satellite, remained in service for nearly six years. Positioned in geosynchronous orbit over the Pacific Ocean at 135 deg W in 1979-1982; 85 deg W in 1982-1984; 135 deg W in 1984; 125 deg W in 1985..
1979 November 21 - . 21:36 GMT - . Launch Site: Cape Canaveral. Launch Complex: Cape Canaveral LC40. LV Family: Titan. Launch Vehicle: Titan IIIC. DSCS II-13 - . Payload: DSCS II F-13 / OPS 9443. Mass: 611 kg (1,347 lb). Nation: USA. Agency: USAF. Program: DSCS. Class: Communications. Type: Military communications satellite. Spacecraft: DSCS II. Completed Operations Date: 1994-07-19 . USAF Sat Cat: 11621 . COSPAR: 1979-098A. Apogee: 37,195 km (23,111 mi). Perigee: 37,104 km (23,055 mi). Inclination: 13.60 deg. Period: 1,506.30 min. Spacecraft engaged in practical applications and uses of space technology such as weather or communication (US Cat C). Positioned in geosynchronous orbit at 12 deg W in 1980-1981; 131 deg W in 1981-1983; 179 deg W in 1983; 175 deg E in 1983-1989;179 deg W in 1989-1993 As of 3 September 2001 located at 21.08 deg E drifting at 16.828 deg W per day. As of 2007 Mar 10 located at 37.50W drifting at 16.828W degrees per day. DSCS II-14 - . Payload: DSCS II F-14 / OPS 9444. Mass: 611 kg (1,347 lb). Nation: USA. Agency: USAF. Program: DSCS. Class: Communications. Type: Military communications satellite. Spacecraft: DSCS II. Completed Operations Date: 1995-06-19 . USAF Sat Cat: 11622 . COSPAR: 1979-098B. Apogee: 36,351 km (22,587 mi). Perigee: 36,316 km (22,565 mi). Inclination: 13.30 deg. Period: 1,464.10 min. Spacecraft engaged in practical applications and uses of space technology such as weather or communication (US Cat C). Positioned in geosynchronous orbit at 66 deg E in 1980-1981; 12 deg W in 1981-1986; 179 deg W in 1986-1990; 174 deg E in 1990; 65 deg E in 1991-1994 As of 31 August 2001 located at 27.01 deg W drifting at 6.916 deg W per day. As of 2007 Mar 11 located at 50.79E drifting at 6.926W degrees per day. 1981 March 16 - . 19:24 GMT - . Launch Site: Cape Canaveral. Launch Complex: Cape Canaveral LC40. LV Family: Titan. Launch Vehicle: Titan IIIC. IMEWS 11 - . Payload: DSP MOS/PIM s/n 10 / OPS 7350. Mass: 1,170 kg (2,570 lb). Nation: USA. Agency: USAF. Class: Surveillance. Type: Early warning satellite. Spacecraft: DSP. Completed Operations Date: 1992-01-01 . USAF Sat Cat: 12339 . COSPAR: 1981-025A. Apogee: 35,527 km (22,075 mi). Perigee: 35,463 km (22,035 mi). Inclination: 2.00 deg. Period: 1,421.20 min. Multi-Orbit Satellite / Performance Improvement ballistic missile launch detection satellite, remained in service for nearly eleven years. Positioned in geosynchronous orbit over the Pacific Ocean at 69 deg W in 1981-1982; 135 deg W in 1982-1984; 75 deg E in 1984-1985. As of 2003 Mar 6 located at 40.27E drifting at 0.598E degrees per day. 1982 March 6 - . 19:25 GMT - . Launch Site: Cape Canaveral. Launch Complex: Cape Canaveral LC40. LV Family: Titan. Launch Vehicle: Titan IIIC. IMEWS 13 - . Payload: DSP MOS/PIM s/n 13 / OPS 8701. Mass: 1,170 kg (2,570 lb). Nation: USA. Agency: USAF. Class: Surveillance. Type: Early warning satellite. Spacecraft: DSP. Completed Operations Date: 1998-12-31 . USAF Sat Cat: 13086 . COSPAR: 1982-019A. Apogee: 35,598 km (22,119 mi). Perigee: 35,520 km (22,070 mi). Inclination: 2.00 deg. Period: 1,424.40 min. Multi-Orbit Satellite / Performance Improvement ballistic missile launch detection satellite, remained in service for over sixteen years. Positioned in geosynchronous orbit over the Pacific Ocean at 68 deg W in 1982; 35 deg W in 1983-1988; 165 deg W in 1988-1989; 35 deg W in 1989-1991.